Long a sanctuary for ironworkers and stevedores, the interior of the Irish Haven in Brooklyn’s Sunset Park is dark and murky, and the buff brick exterior looks about as unpretentious as they come. The Irish, however, are experts at mixing the poetic with the mundane, and bartenders have been known to quote Yeats and Joyce as they pour pints of Guinness and shots of Jameson for patrons, many of whom live in the neighborhood and have been coming to the Haven for years. It’s a no-frills slice of timeless Brooklyn, remaining open even as Irish and Scandinavian establishments have given way to a newer neighborhood identity that skews more Latino and Chinese. 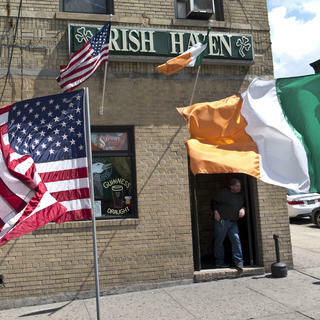 The Irish Haven was established in Brooklyn's Sunset Park in 1964. This Sunset Park bastion was originally founded in 1964, although the building it’s housed in dates from 1911. 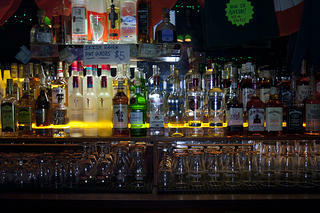 In 2011, the bar came under new management when Matt Hogan leased it from the Lawler family, the original owners. Hogan brought just enough change to usher the Haven into the 21st century—including a Facebook page, a trivia night, and a weekly Taco Tuesday special—but not enough to alienate the regulars. Most of the bartenders still speak with thick Irish brogues. Live music, karaoke, pool, beer pong tournaments, an annual “prom,” and other neighborhood events bring even more life to the old-timey, wood-paneled interior. There’s even an old-fashioned telephone booth, in case you need to call your bookie. The Haven’s interior oozes authenticity, so much so that director Martin Scorsese opted to film scenes from the 2006 Oscar-winning film The Departed there, despite the fact that the movie’s action is technically set in Boston. A framed photograph of “Saint Marty” on location is proudly displayed on the wall. More recently, the Haven has also been captured in a few scenes from FOX’s hit Batman prequel, Gotham. 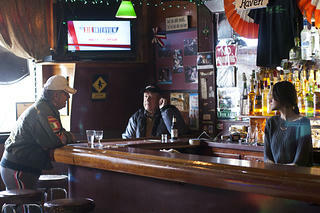 Old-timers at the Irish Haven. The interior's wood paneling and tile floors have remained largely unchanged since 1964. Beer prices haven’t changed much—you can still get a Guinness for $5 a pint, and bartenders turn a blind eye to the occasional cigarette. Hogan has said that he goes through eight barrels of Guinness a week. If you’ll be in the Big Apple anytime soon and want to experience an evening at this “legendary” dive bar firsthand, we encourage you to do so—but be warned, in true dive bar spirit, it is cash only. Here are a few things you’ll need to know before you go. Hours: Monday-Saturday 8 a.m. to 4 a.m., Sunday 12 p.m.—4 a.m.
Don’t Miss: The jukebox, featuring a mix of country, rock, and traditional Celtic tunes. You’re having: A Guinness—what else? At $5 a pint, the Haven’s prices can’t be beat.